OverviewWhen the military takes over a ski resort, you take to the slopes and try to uncover the mystery in this story-based snowboarding game. Dark Summit is a snowboarding game that does away with competition based gameplay and racing, bringing in a new mission based gameplay. The game still features tricks and levels that full of jumps, halfpipes and grindable objects. Missions have you finding bombs, racing people, doing ridiculous stuff... can't remember the real plot. Once you've done enough missions you'll unlock more levels. I found this game very enjoyable and a refreshingly new way to play a snowboarding game. The gameplay is great, the music i can't remember, but the sounds are fun enough. The controls are a little weird, but it works. Now you can add videos, screenshots, or other images (cover scans, disc scans, etc.) 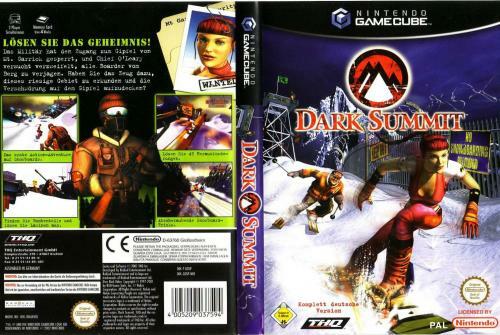 for Dark Summit to Emuparadise. Do it now!